I know that many of us are embarking upon resolutions to eat healthy as we start the new year. 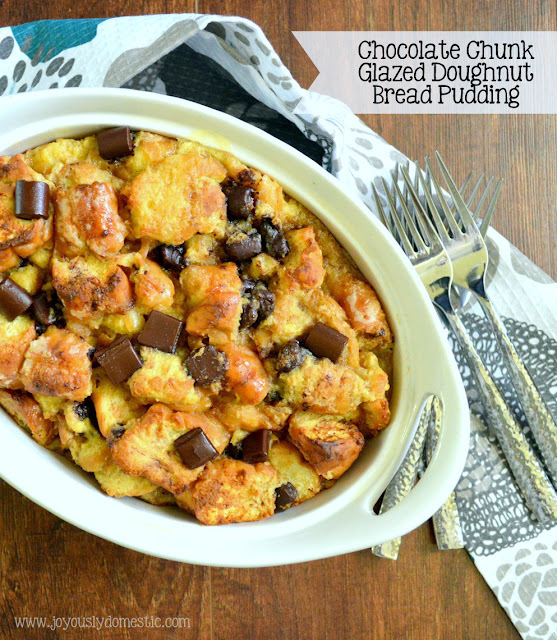 So, I do apologize upfront for tempting you with this over-the-top sensation that is Glazed Doughnut Bread Pudding. But, I just had to shout from the rooftops how aaahh-maaaay-zzzzing this little ditty of a recipe truly is. So, maybe take a deep breath and hear me out? This is heavenly. This is sinful. Yes, it's both. But, darn it ... it is fabulously worth every calorie. The most dangerous thing about this recipe? It takes like, only a handful of minutes when it comes to prep time. So, it's almost way too easy to create something this naughty. Again, I am sorry. But, "everything in moderation" really is a great motto to live by when it comes to food indulgences. So, allow that to apply with regards to this decadent recipe, then smile and savor. Yields 6 - 8 servings. Preheat oven to 350 degrees. Grease a medium sized baking dish with butter or non-stick spray. Set aside. In a large mixing bowl, whisk together the eggs, milk, heavy cream, sugar, vanilla extract, cinnamon and nutmeg until well-combined. Add in the donut chunks and stir gently to coat. Allow donuts to soak in custard for about ten minutes while stirring occasionally. Gently stir in 1/2 cup of the chocolate chunks. Author's Note: At this point, I either allow the pudding to rest on the counter for about fifteen minutes before baking. Or, it can be covered and stored in the refrigerator for up to two hours prior to baking. Just be sure to allow it to come close to room temperature before baking if you've stored the pudding in the fridge. 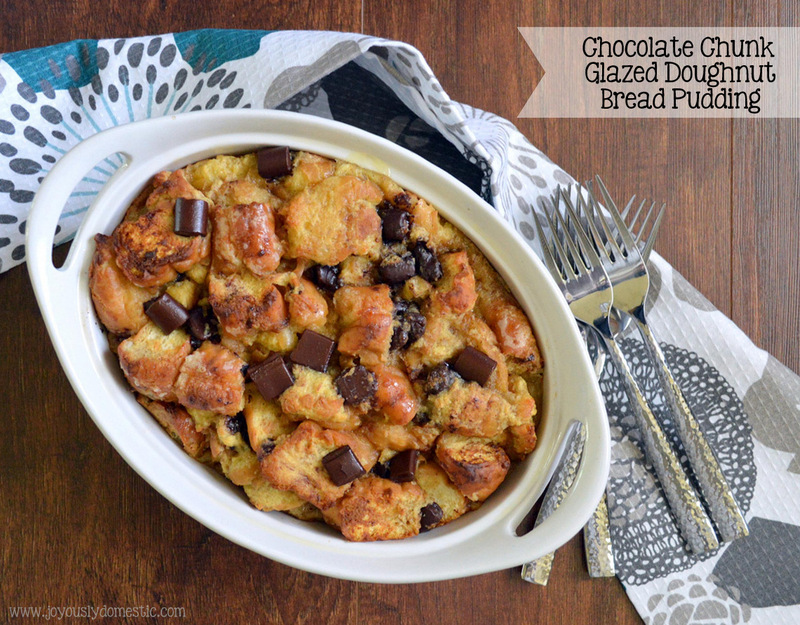 Top with remaining chocolate chunks just before baking. Bake for 35 - 50 minutes. (Baking time will depend upon the size vessel used. The thickness/thinness of your pudding can alter your baking time.) Pudding is done when the top is slightly golden brown, the edges of the donuts on top of the pudding are beginning to crisp and the center is no longer wobbly (custard is "set"). Author's Note: The bread pudding is wonderful served as-is. Or, confectioners sugar can be dusted on top at time of service. A drizzle of caramel sauce is a great addition, as well.